iPrint is a friendly printing utility saves you time and Money to decrease your printing expenses by up to 60%. iPrint now Free for personal or business use and support for Windows XP, Vista and Window 7. While doing print-job iPrint keeps track of print-jobs measuring total savings and displaying handy reports. iPrint automatically detect and remove pages with no content with options to manually remove unwanted pages easily, iPrint also allows printing multiple pages on each sheet of paper. Print multiple pages on each sheet of paper. One of the ways iPrint saves you money is by scaling down pages so that you can fit two or four pages on each sheet of paper. Collect print jobs. iPrint allows you to group together print job requests from multiple applications into a single iPrint session. Measure your savings. 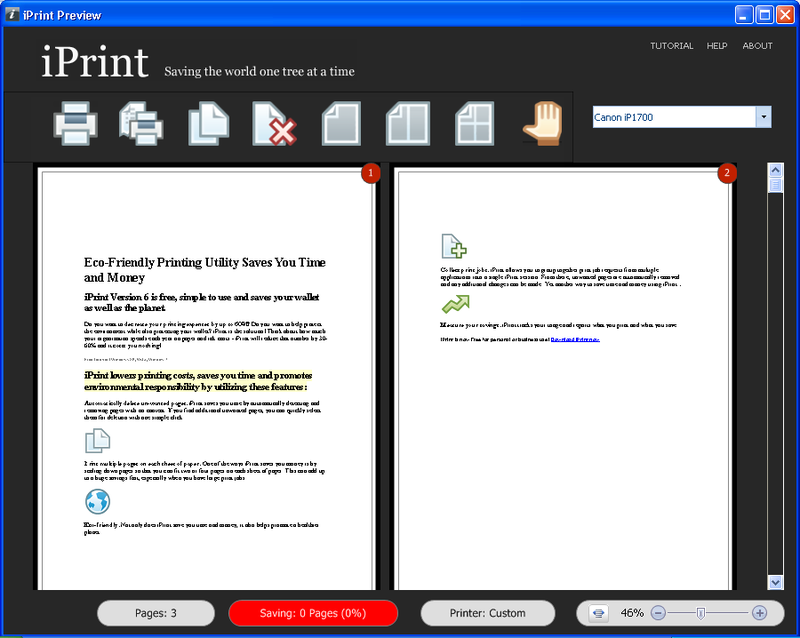 iPrint tracks your usage and reports what you print and what you save.